Kingi In The Ring? The reigning Kingi? The Kingi wears the crown? … Horrible Puns aside, Nikora Lee-Kingi was crowned the new King In The Ring Lightweight Champion on Friday night, overcoming stablemate Dominic Reed in the final. The two fighters, both from South Island Lee Gar gym, fought through the eight man eliminator event to match up for three rounds in the 62kg final, held at Barfoot and Thompson Arena in Auckland. Lee-Kingi overcame Hermain Perwaisy of Core MMA in his first fight, and a difficult second fight against Strikeforce’s Ben Spears, to make his way into the final. Heading into the final, Reed looked considerably more well rested than his opponent having dispatched his semi final opponent by way of knockout in only the first round. Reed opened the fight strong, landing some solid punches and wrapping Lee-Kingi up for a knee in the clinch but as the rounds progressed it was clear Lee-Kingi’s experience would see him through. 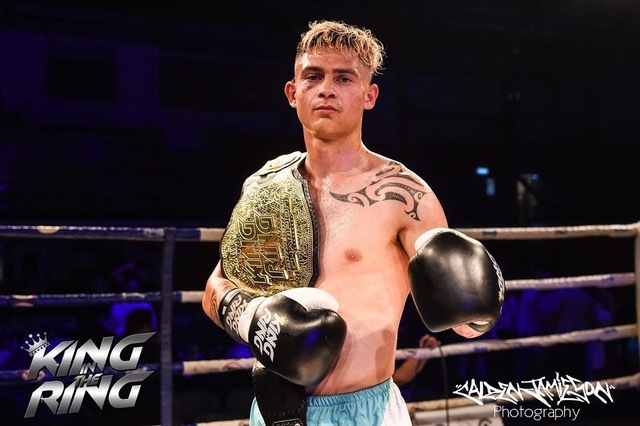 The eight man eliminator series, produced by Jason Suttie’s Elite Thai Kickboxing and sponsored by Wai Life, continues its own reign as the king of kickboxing events in New Zealand. Attended by thousands of kickboxing fans and watched by tens of thousands more on Sky TV around the country, King In The Ring has become an unmissable event for kiwi fight fans. Jamie Patterson and Isaac Savage of NZ Fighter were in attendance, bringing you our report of the action from ringside below. Stefan Harrison from Freestyle MMA squared off against Jordan Maroroa of South Auckland Lee Gar in the first elimination fight of the evening. Maroroa opened up well with a couple of quick leg checks before Harrison wrapped him up to land a knee to the head. The two fighters traded blows throughout the first round, with Harrison finding his way to the canvas once but only by way of a trip. Harrison opened the second round with a brutal flurry taking Mararoa to the ropes. Mararoa fought well to find his way off the ropes and land a couple of heavy right hands but continued to eat shots from Harrison. Having landed two knees in the first and continued the punishment in the second it was clear Harrison would be in front on points going into the third. Mararoa opened the third with a big overhand right before controlling Harrison over to the ropes. Harrison landed a couple of quick body shots off the ropes and managed to turn Mararoa but it wasn’t long before he found his back against the turnstile once again and swallowed yet another huge overhand right from Mararoa. Harrison looked to be hurting from the final round but he stayed on his feet and having one the first two, the judges gave the decision to the Freestyle MMA fighter. Perwaisey opened the first with leg checking before wearing a solid roundhouse to the body from the eventual champ. Perwaisy landed some good punches throughout the first but Lee-Kingi kept control of the fight landing some good kicking combinations. Lee-Kingi rose from the floor looking to meet Perwaisy with a flying knee but missed before the Core MMA fighter sent him to the mat. Climbing back to his feet, Lee-Kingi ducked a series of punches from Perwaisy before landing some strong knees to the body of his opponent to end the round. Kicking off the second round, quite literally, Lee-Kingi landed a huge head kick to the face of his opponent, following up with a good punching combination. Perwaisey managed to stay on his feet started to come forward more in the second but almost ate a spinning back fist from Lee-Kingi before the round ended. Perwaisey tried to control the third with some good front kicks to Lee-Kingi’s body but a spinning back kick from Lee-Kingi had him walking backwards again. A second spinning back kick from Lee-Kingi to the upper thigh of Perwaisy saw him stumbling before a flying knee and a left kick sent Perwaisy to the ground moments before the round ended and sealed the UD for the eventual champ. The second eliminator, and maybe the most exciting fight of the night, saw reigning champ Joey Baylon take on Strikeforce dark horse Ben Spears. Baylon opened the fight aggressively but Spears seemed much quicker, landing a series of kicks to the legs, body and head of the ETK fighter. With Baylon continuing to come forward it looked as if he couldn’t touch Spears early on with the Strikeforce fighter ducking a series of punches. Baylon tried to switch things up opting for a kick to the body but again Spears was quicker catching Baylon’s leg and taking him to the floor. Baylon finally managed to land one of his heavy hands on Spears but the bell was ringing and the round was over. Baylon opened up the middle round looking to land a jab but the quicker Spears caught him and again sent him to the canvas just seconds into the second. Baylon rose to his feet and seemed to find another gear as a flurry of punches had Spears against the ropes, but Spears landed a solid series of shots before again taking Baylon to the ground. With Spears continuing to slip punches and land leg checks, Baylon wrapped him up in the clinch to try and slow the pace, but shortly after they release Spears ducks another shot from Baylon and punches the champ through the ropes! Baylon came back aggressively with a strong combo and had Spears on the ropes but solid right from Spears sent him back to the mat. A huge exchange at the start of the third saw the reigning champ come off the better, but as the fight settled back into a rhythm Spears continued to slip punches and land good counter shots. Spears ducked two more punches from Baylon before landing a strong right kick of his own to the face of Baylon, knocking him down. Likely knowing he’s been bested, Baylon threw a series of Hail Mary’s but Spears took him to the ground once again and angrily stepped over the the champ as if to signal his victory as the final bell sounded. A crushing defeat for the reigning champ, but a statement victory for the Strikeforce fighter. The third elimination bout saw Nic Aratema coming forward early against Shuriken MMA’s Logan Price, landing a series of kicks early in the first. A couple of strong rights from the Aratema and the round settled into a good rhythm. Aratema landed a strong kick to the body before being cornered by Price who lands a flurry of punches. Price throws a combo at the end and then trips right on the bell. Aratema started strong again in the second landing a series of punches before the fight again settled into a soft rhythm. Price throws a hard right but missed before catching a series of punches from the Team Hammerhead fighter. A head shot and a low kick from Aratema before Price looked for the clinch and the knee to the head, but fails to land before the bell sounds. Round three kicked off with Aratema landing a solid kick to the body of Price and the fighters exchange blows. Aratema landed a flying back kick as the only moment of excitement in an otherwise stale round with both fighters seeming to think they’d won already. From where we sat it seemed an obvious victory for Aratema but with Dan Hennesey reading the scorecards it turned out the judges saw it differently with Aratema defeated and Price moving forward. The fourth and final bout of the quarter finals saw eventual second place getter Dominic Reed land a solid right, knocking Ale Taumalolo through the ropes at start of the first. Foreshadowing Reed’s semi final victory to come, the Beyond Gym fighter took a five count before the fight got back underway. Reed landed a series of strong punches but the fighters are separated when Reed lands a blow to the groin of his opponent. When the fight resumes Reed throws Ale to the ground and then works him to the corner for a series of brutal haymakers before the bell brings him sweet relief. Round two and the aggression from Reed continues, Ale throws a good kick but its caught and Reed works him to the corner again. Reed chases Taumalolo around the ring before Ale throws Reed to the ground and it feels like the gritty fighter is back in this. A flying knee from Taumalolo misses and he needs to cover up against the ropes to weather a storm of blows from Reed. Reed regains control but the two fighters now feel more closely matched as Reed begins to tire. Reed continues to land strong punches and even the bell can’t stop the two warriors with the referee having to step in to break them apart at the end of the round. Taumalolo opens the third with a flying knee before Reed begins to take control once again. Ale clinches Reed and the two are separated before Reed lands two strong knees to the body. Taumalolo lands a couple of strong shots and the crowd comes to life as the fighter again seems to be clawing his way back into it but again Reed lands a couple of strong punches and regains control with a knee to the head. Reed continues to beat his opponents head with one knee after the other… when will this round end. A dominant victory for the dominator Dominic Reed. There’s a hum of excitement in the crowd before what everyone expects to be the fight of the night. Spears throws Lee-Kingi to the ground early in get first and when Lee-Kingi gets up Spears lands a huge head kick before throwing him again. A flurry of punches and Lee-Kingi is thrown to the ground a third time and it looks like the unmissable Spears is going dismantle yet another early favourite. Lee-Kingi lands a strong right hook but Ben lands another head kick. Spears continues to come forward slipping wild haymakers from Lee-Kingi but Kingi starts to take control, avoiding Spears’ takedown attempts and landing a few punches to end the round. Lee-Kingi lands a solid snap kick to open the second round but eats two body kicks from Spears before Spears takes him to the canvas again. Kingi tries a head kick and Spears takes his leg out from underneath him. Nikora lands some solid left and right hooks before blocking Spears’s flying knee. Lee-Kingi seems to be taking control but also seems to be tiring. Round three and Spears lands a couple of strong kicks to the body before darting backwards to avoid Lee-Kingi’s hands. Lee-Kingi misses a spinning backlist but pushes Spears back and continues his aggression. A spinning back kick to the leg and Spears stumbles to meet a cross kick to the head from Lee-Kingi. Spears is bleeding from the left side of his face but looks deadly, throwing a huge head kick that just misses Lee-Kingi before the bell rings. An unbelievable matchup, just won by the eventual champ. Reed opens up aggressively in the first landing several kicks to the body and a couple of right hooks to the head before missing a spinning head kick. Slipping a flying knee and a big hook from Price, Reed comes forward and gets wrapped up in the clinch. Price looks better than his first fight but Reed corners him and floors him with a big hook to the liver. Price fails to get up for the first knockout of the night. For the second time two fighters from the same gym meet in the final at King In The Ring. Reed starts well landing a series of punches, and wrapping Kingi up, but Kingi fights back and the referee has to warn Reed for double knees in the clinch. Reed continues to come forward landing some punches but Lee-Kingi rocks him with some solid shots sending Reed’s mouthguard across the ring. Kingi lands a front kick then a solid left hook to the body of Reed, they clinch and Kingi lands a knee off the ropes to body of Reed before the round ends. Reed rocks Lee-Kingi with a right hook to at the start of the second. Lee-Kingi misses a flying knee and the dominator lands a series of solid hooks to the head and body beating Lee-Kingi into the corner. Clearly the benefit of extra rest is starting to show. The two move around the ring exchanging blows before a strong right hook and a kick to the liver sends Reed to the canvas. Reed gets up but he quickly heads back to the canvas and waits out an eight count before the end of the round. Round three, and the two fighters show their close friendship by hugging in the centre of the ring before they get to work. Reed lands some solid punches and catches a kick from Lee-Kingi, sending him to the floor. Seconds later it’s Reed’s turn on the mat as Lee-Kingi returns the favour from his friend. The Dominator lands knees to the body and an overhand right before losing his mouth guard again on the end of Lee-Kingi’s fist. Reed is now bleeding from his left eye. A body shot and kicks send Reed to the canvas again but he gets up quickly and fights on. A big over hand right lands from Lee-Kingi and there’s 10 seconds to go. The two fighters square off and throw punches like men possessed before the bell rings and they’re mates once again. An incredible fight between friends, and as Dan Hennessey reads the judges scorecard Dominic “the Dominator” Reed falls to his knees, bowing to his victorious friend and stablemate. Nikora Lee-Kingi is the new King In The Ring. Follow NZ Fighter over the next few days as we post coverage of the exhibition fights held on the same night, including the South Pacific WKBF Women’s Featherweight Championship bout.